So that's a courgette. I thought that was the name for a cucumber. I have made the galette twice now. Once I used a cherry pie filling and served it with ice cream for my mum's dessert. She love it. The almond paste really makes it. Than you for that. So happy you liked the galette and have made it your own (sounds good with cherries and ice cream!). I also love the almond paste and I am going to use it in a tart or something soon! I keep thinking about all those courgettes we used to grow!!! This looks divine! And easy too. Your snow photo is beautiful Ivan. You have more than we do. It is +10C here now and most of the snow we had has melted away!! Good bye! I'm sure there is more to come before March. Good to 'see' you and have a great week ahead. It's a quick thing but tastes good! We have more snow falling now - we made it to Rouen today and got back just in time! The snow will only be here a short time! Yum Ivan! I miss my garden at times like this! 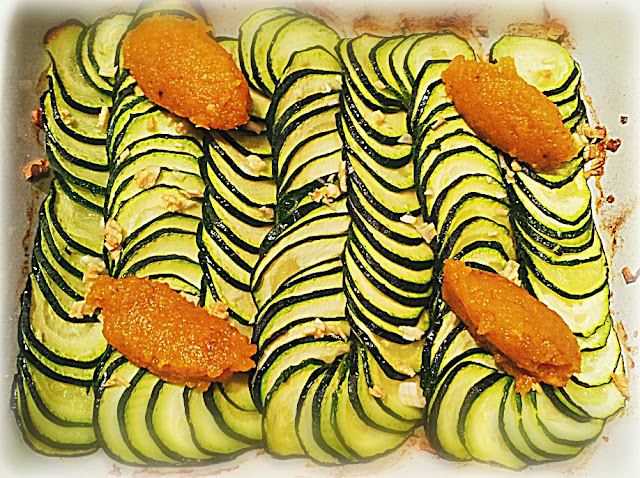 My FAVORITE recipe for zucchini is Panzanela, which I made last summer...but I love the idea of this light meal after a binge of a weekend! the pepper must be a very complimentary taste. Thank you, I must make the Panzanela soon! I am laughing because as of Friday I have subscribed to Bon appetit, I buy it when I can get a copy but it's not often enough!! I will miss this month though, so thanks for the link and I shall defiantly be trying it! Oh and the snow is so pretty! I love clean, freshly fallen snow! Thanks, there are a lot of bunny tracks now!!! That sounds like a great side dish also, lovely snowy photo. Thanks, must be funny for you as you have record highs at the moment! Hope you had a wonderful trip. I've learned another word for zucchini! That's a pretty snow picture. Our snow is gone...for now. March is our "snowiest" month. Yes, the French word also used in the UK. From the word "courge" for squash and the ending meaning a small one! I am hoping January will be our snowiest month, but we will have to wait and see!! this looks like a great, light recipe, thanks. And your snow picture is lovely -- nice young orchard you have there, it looks like. Thank you, we lost a lot of the old orchard in a storm. These trees was replanted 12 years ago (7 year old trees). They are a mix of 30 old varieties of apples for cider (to make Calvados). It looks delicious, I love courgettes, and I have just learn its name in English, so I have learned two things in one, a new recipe and a new word. Thank you, happy you liked it. Your English is very, very good. 'Zucchini' is used in America and 'courgette' is used in the UK (the same as in French). Zucchini is one veggie we don't eat enough of....now with this easy prep recipe we will begin to enjoy it more. 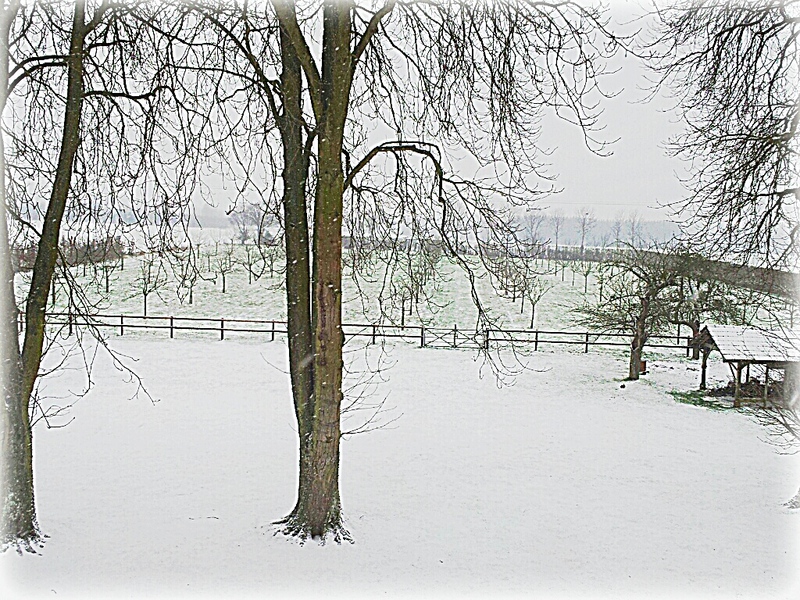 The white snow gives your landscape a stark beauty...very nice! Sorry, I missed this comment! I use a lot here as they are always available from Spain. It is a good base for adding taste or spices too. It can be a bit too stark... I want some leaves!! Hi Ivan! When our zucchinis get growing in Colorado, they can turn into monsters! I shall try this recipe in zucchini season. Your snow is lovely. Ours has vanished, but we may get some on Tuesday. I hope that you are enjoying your weekend. I'm enjoying catching up on everyone's posts now, because I was out of town earlier this week. I hope all is well with you and yours. Our also if undetected grow huge! Our snow came and went a few time also. Hope you enjoyed your trip away? Thanks for asking, all's very well here.